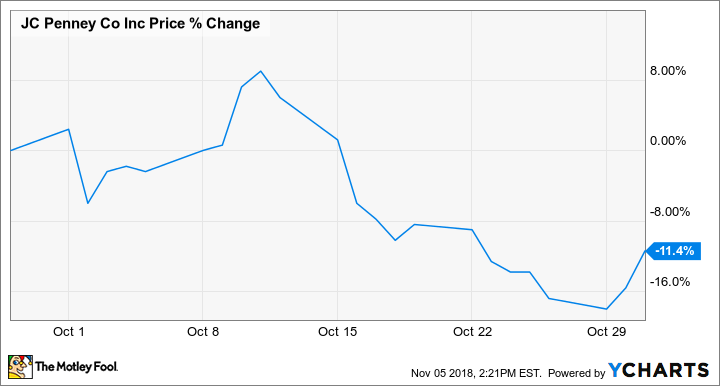 According to data from S&P Global Market Intelligence, the department-store chain closed down 11% for the month, but shares were volatile, even spiking in the first half of October, as the chart below shows. J.C. Penney kicked off October by announcing a new CEO on Oct. 2. The struggling department-store chain said Jill Soltau would become its new leader four months after former CEO Marvin Ellison left to become chief at Lowe's. Soltau brings key experience as a merchandiser and in women's apparel; she has previously served as CEO of JOANN Stores and was president of Shopko, a midwest-based department-store chain. Though J.C. Penney shares sold off initially on news of Soltau's hiring, they gained over the following week, a sign that investors perhaps warmed up to the decision after initial uncertainty. On Oct. 10, J.C. Penney stock surged 7% after the company extended its relationship with Synchrony Financial, ensuring that J.C. Penney will continue to provide its credit card to loyal shoppers, marking a key vote of confidence even as the company's future seems uncertain. The stock began sliding shortly after that, though, as reports emerged that Sears was about to declare bankruptcy, which it did on Oct. 15. Penney stock fell 11% over a two-day span on the news -- a surprising move, since the retailer could benefit as it gains former Sears shoppers. However, the market seems to think Penney is more likely to follow in Sears' footsteps, and liquidation sales at Sears could deplete Penney's own revenue during the key holiday season. Finally, the stock got a boost toward the end of the month when it named an interim CFO, Michael Fung, who brings experience at retailers like Walmart and Neiman Marcus. With J.C. Penney stock hitting a new low seemingly every week, the company is approaching a "do-or-die" point. With broad retail sales surging, consumer confidence up, and many of its peers posting blowout results, Penney desperately needs to show investors solid growth in its third-quarter report this month and for the crucial holiday season coming up. If the company can't make a buck in this economy, it probably won't survive the next recession.